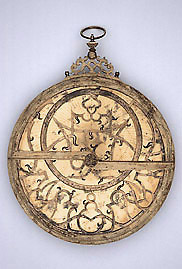 Although unsigned, this astrolabe has many of the characteristics of instruments produced in the workshop begun in Louvain by Gemma Frisius and directed by Gualterus Arsenius. These include the pattern of tracery used in the rete and the inclusion of a 'quadratum nauticum' inside the mater. It may be by a slightly later maker from the same region, perhaps associated with the Louvain workshop at some time in his career, or perhaps simply copying the Arsenius style.